William Simpson is the namesake of founder, William Simpson who started his automotive journey by establishing a used car dealership. Soon after, success and profitability allowed the business to acquire a Nissan franchise situated in Fish Hoek (found in the Southern Suburbs of Cape Town, South Africa). Thanks to the dedication of the staff and loyal customer base, the business outgrew its Fish Hoek premises as well as its next location in Lakeside. 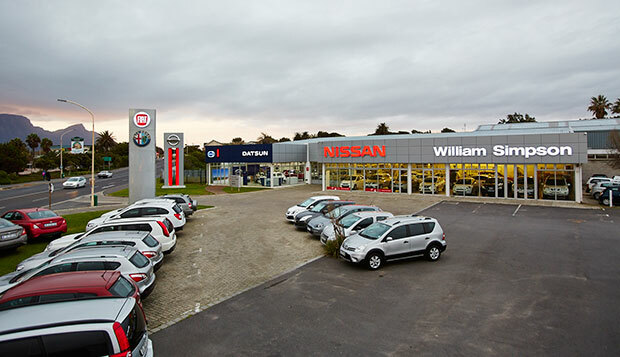 The dealership received increasing success, was given the opportunity in 2004 to develop a large dealership in Tokai, Cape Town, where the Nissan and Datsun brands now currently reside. We chose our motto because it represents our personal approach to getting our established and new customers, the very best prices. The motto “Sharper pencil – Better Deal” means that we strive to excel on quality, price and customer service. We do this by developing and maintaining an on-going relationship with customers, while keeping to Nissan and Datsun’s high brand standards. The predecessor to the well-known Nissan brand, is the lesser seen but still fondly remembered Datsun brand. So named as an acronym of the original company investor’s surnames. With the collaboration with Austin Motor Company from the 1930’s to the 1960’s, through this overseas partnership, Datsun began experiencing international success and grew into the household name we know today. Nissan Motor Company was founded way, way back in the 1930’s. Nissan strengthened the Austin patents to create engines that made the markets immediately take notice. It was through the Datsun 240Z that Nissan was catapulted into international automotive glory. This Japanese automotive manufacturer has since aligned itself with French auto-manufacturers Renault, to create an alliance that places them as the sixth in the standings of global automakers. Nissan Motors is the umbrella name under which Nissan, Datsun and Infiniti brands are now sold, with performance tuning parts and kits supplied by NISMO. Fantastic cars backed by a fantastic brand. And we are proud to be an authorised Nissan and Datsun dealership, proud of its and our heritage, excited for the future we will share together.